THE HOUSE OF Commons has voted to back an amendment seeking to replace the Irish backstop with unspecific “alternative arrangements”. The amendment passed by 317 votes to 301. Although the EU has repeatedly ruled out renegotiating the withdrawal agreement already agreed with Theresa May’s government, MPs this evening backed supporting new alternatives to avoid a hard border in Ireland which would ditch the backstop altogether. It is not immediately clear what these arrangements would be, and how something that isn’t the backstop would ensure no hard border. This vote represents a major boost for the Prime Minister, and gives her the backing of parliament to go back to the EU to try to renegotiate on the issue of the backstop – but it is a renegotiation the EU has repeatedly said won’t happen. 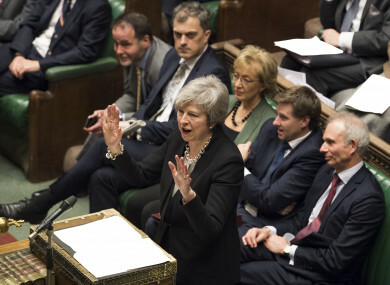 Speaking immediately after the vote, Theresa May said there was now a clear route towards getting some form of a Brexit deal passed in the House of Commons, and Labour leader Jeremy Corbyn said he’d be willing to meet the prime minister on how to move forward in talks. European Council President Donald Tusk also responded to the vote, with a spokesperson saying the withdrawal agreement – including backstop – is not up for renegotiation. The Irish government was also adamant there would be no renegotiation in its reaction. “The EU position on the Withdrawal Agreement, including the backstop, is set out in the conclusions of the December meeting of the European Council,” it said. “It has not changed. The amendment managed to unite MPs from opposing views on the matter, with supporters including arch-Brexiteers within the Conservatives such as Jacob Rees-Mogg, and remainers such as Nicky Morgan. It would seek a redrafting of the plans for the backstop, with the plan also to seek an extension to the transition period – the time where the trade and other matters operates the same as it did prior to the UK leaving the EU – until 2021. The proposal also received the support of the DUP and its 10 MPs. The amendment put forward by Sir Graham Brady, who said if the motion was approved by Parliament, it would give May “enormous firepower” to go back to Brussels and renegotiate the Brexit divorce deal. Prime Minister May also backed the Brady amendment, and urged MPs to follow suit earlier today. She told the House of Commons today it would send a message to the EU that she could win support for her withdrawal plans if the backstop was dropped from the deal. “We have the chance to show the European Union what it will take to get a deal through this House of Commons. What it will take to move beyond the confusion, division and uncertainty that now hangs over us,” she said. However, May also accepted there was “limited appetite among our European partners” to changing the Brexit deal, which took almost two years to negotiate. Speaking in the Commons following the vote, Scottish National Party MP Ian Blackford said that by rejecting the backstop, “the Conservative party has effectively ripped apart the Good Friday Agreement” and “ripped apart a treaty that has secured peace on the island of Ireland”. DUP MP Nigel Dodds rejected this assertion and said it was “utterly reckless” to speak in those terms. Speaking yesterday, Sabine Weyand, deputy to EU Brexit negotiator Michel Barnier, said: “There’s no negotiation between the EU and the UK. That negotiation is finished. It does feel like Groundhog Day. She added Britain risked crashing out of the EU without a deal “by accident” because London cannot decide what it wants. French President Emmanuel Macron also said this evening that the current Brexit deal on the table is the best agreement possible and is not renegotiable”, as the UK plots re-entering talks. MPs rejected all of the other amendments earlier, with one exception. The Spelman amendment was passed – with 318 vs 310 voting in favour of stating the UK cannot leave the EU without a deal. That vote however, is not legally binding and is largely symbolic. Email “MPs vote to ask the EU to replace Irish backstop with unspecific 'alternative arrangements'”. Feedback on “MPs vote to ask the EU to replace Irish backstop with unspecific 'alternative arrangements'”.